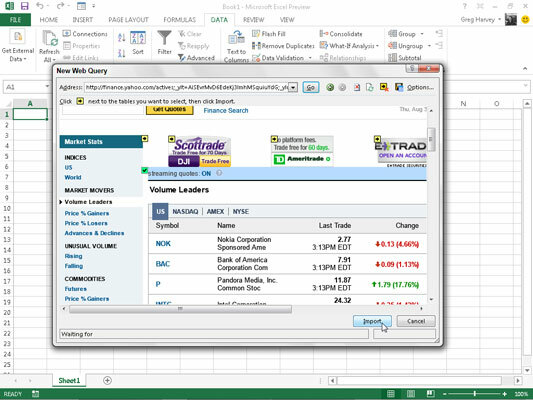 Excel brings this data from the Volume Leaders table on the Yahoo! Finance web page into the worksheet as cell ranges rather than as an Excel Table. If you want to be able to sort or filter this imported financial data, you need to select one of its cells and then select the Format as Table button on the Home tab to format them and add the requisite AutoFilter buttons. When formatting data as a table, you remove all external connections to the data on the website. You can make web queries only when your computer has Internet access. Therefore, if you’re using Excel 2013 on a portable device that can’t currently connect to the web, you won’t be able to perform a new web query until you’re in a place where you can connect.